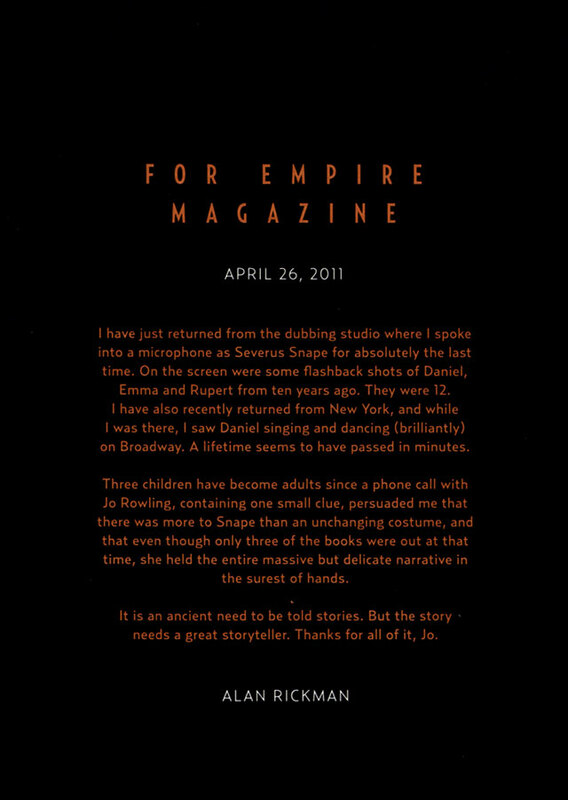 Snape Bids Farewell to that Damned Potter Brat | Critical End! I’ve always wondered if Alan Rickman was truly into the Harry Potter films or just doing it for the check. That’s why it’s great to read this sweet, genuine note he penned for Empire Magazine about his experience with the character and his trio of young costars. I’m betting the cast and crew of Bottle Shock didn’t even get Christmas cards. Finally! Hobbit News to (Kinda) Care About! This entry was posted on Monday, May 30th, 2011 at 6:32 amand is filed under . You can follow any responses to this entry through the RSS 2.0 feed. Both comments and pings are currently closed.